Peter Lawrie drives from the 11th tee on the PGA Centenary Course at Gleneagles. Picture Stuart Adams /www.golffile.ie Mark Foster and Ignacio Garrido have suffered their share of sporting heartache over the past eight years but it remains to be seen if Peter Lawrie can add to their woes in the final round of the Johnnie Walker Championship at Gleneagles. The duo, winless since 2003, lead by three shots on 11 under par from a quintet of players that includes the Dubliner (71), Dane Thomas Bjorn (71), Spaniard Pablo Larrazabal (70), American Anthony Kang (69) and Austrian Bernd Wiesberger (68). It’s not the kind of leaderboard that will send pulses racing but Lawrie won’t care if he can bridge the three shot gap and end his three-year wait for a second European Tour title. Garrido, who recorded his second and most recent tour win by claimining the 2003 Volvo PGA at Wentworth, carded a third round 69 as Foster fired a four-under 68 to leave them tied at the top. The Spaniard will remember Lawrie well from their tussle in the 2008 Spanish Open, when the Dublier beat him at the second extra hole in Seville to claim his first win. Lawrie and his wife Phillippa had two young children at that stage of his career but have since welcomed two more to the fold and is now keen to come home with a trophy in his luggage. Foster, 36, has let more than his share of chances slip away since he captured the 2003 Dunhill Championship for his lone tour win. Damien McGrane tees off at the 14th. 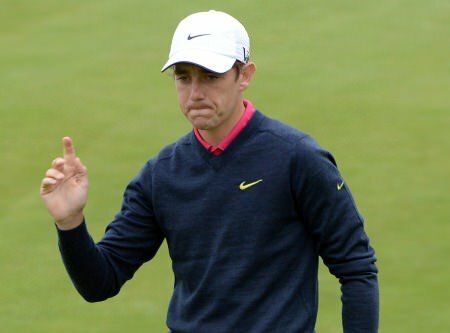 Picture Stuart Adams /www.golffile.ie“I’ve become a serial runner-up,” said Foster, who missed a couple of three footers in the last three holes to lose last year’s Spanish Open. “I hit rock bottom when I lost the Spanish Open last year, but I’ve learnt from it and I look beyond winning now. Garrido said: “It’s nice to be back in this position again and once you’ve been there at the top of your game you know how to win. It will be pressure after such a long time but nice pressure. Lawrie was superb from tee to green, missing just four fairways and only two greens. But he took 33 putts and will need to be more successful with the blade on Sunday. After starting with eight pars, he followed a birdie at the par-five ninth with bogeys at the 11th and 13th. But he finishing strongly with birdies at the 14th and 18th and has every chance of putting the leading pair under pressure as he goes out with Larrazábal in the third last group. Damien McGrane shot a second successive 73 to share 49th on one under with Simon Thornton, who birdied three of his last four holes for a 71. Michael Hoey is tied 63rd on three over after a taking 32 putts in a 75. Peter Lawrie insists his driving accuracy (and his confidence) is coming back after he opened with a round in the 60s for the fourth time in his last six starts in the Lyoness Open powered by Greenfinity. Peter Lawrie drives at the 16th during the second round of the Johnnie Walker Championship, being played over the 2014 Ryder Cup Course, the PGA Centenary Course at Gleneagles. Picture Stuart Adams /www.golffile.ieHe went into the Irish Open with a putter he retrieved from his garage collection, hoping it might spark some better form on the greens. Less than a month later, Peter Lawrie is rolling the ball beautifully again and just a stroke behind leader Ignacio Garrico at the halfway stage of the Johnnie Walker Championship at Gleneagles.